Last night we got together in the studio on Garden of Dreams with a small audience, hosted by Saffia Widdershins, to watch the latest edition of Designing Worlds – DW379 – which is about the making of Arrivals & Departures. It’s something that happens whenever there’s a new edition of DW, and people are invited to come and watch the show at the same place and time. Saffia gives a countdown and then everyone watches it in sync, so people can comment about what they see. It is a nice communal event for the Designing Worlds crew and devotees of the series, who turn up regularly. It’s also nice to meet people we haven’t seen before, who perhaps have seen the notice in a group, or someone’s mentioned it to them, and they came along to see what it is all about. Someone new turned up last night, and not only that, they stayed and watched the whole show, which in this case was quite long. We’d like to say a big “Thank You” for those kind words, which really made our day. As Cale put it, “I can’t begin to say how much comments like this mean to me, and… to my partners as well. All the possible recognition from Festivals we have been submitting the film to would be cool, but nothing beats the satisfaction of a response like this from someone who was touched by our creation.” Very true. 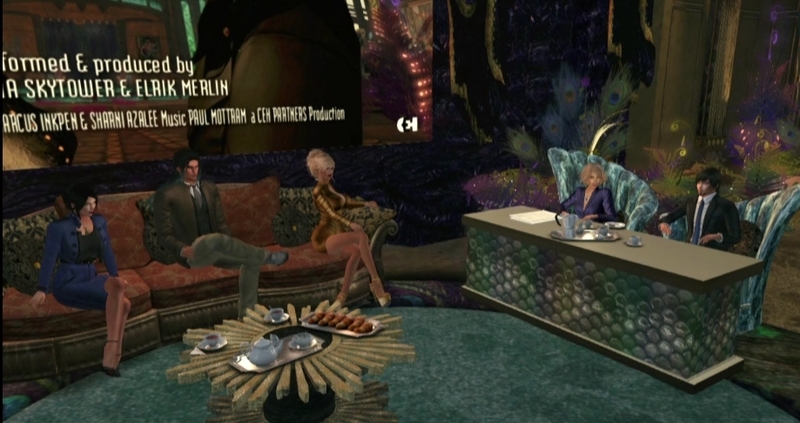 The header image shows the CEH team being interviewed by Saffia and Corwyn on DW379. If you have yet to see Arrivals & Departures yourself, you can watch it below.